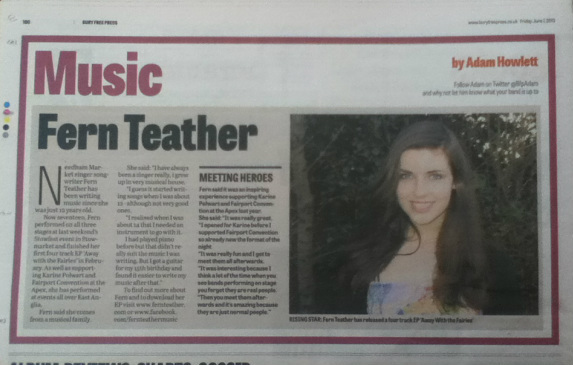 Needham Market singer song-writer Fern Teather has been writing music since she was just 12 years old. Now seventeen , Fern performed on all three stages at last weekend's Stowfest event in Stowmarket and finished her first four track EP 'Away with the Fairies' in February. As well as supporting Karine Polwart and Fairport Convention at The Apex, she has performed at events all over East Anglia. Fern says she comes from a musical family. She said "I have always been a singer really, I grew up in a very musical house. I guess I started writing songs when I was about 12 - although not very good ones. I realised when I was about 14 that I needed an instrument to go with it. I had played piano before but that didn't really suit the music I was writing. But I got a guitar for my 15th birthday and found it easier to write my music after that"
Fern said it was an inspiring experience supporting Karine Polwart and Fairport Convention at The Apex last year. She said "I opened for Karine before I supported Fairport Convention so already knew the format of the night. It was really fun and I got to meet them all afterwards. It was interesting because I think a lot of the time when you see bands performing on stage you forget they are real people. Then you meet them afterwards and it's amazing because they are just normal people." RISING STAR: Fern Teather has just released her four track EP 'Away with the Fairies"